The morning is cold, with snow and bluster. It’s January 1st, 2019, my second New Year’s Day in a world without my older sister. 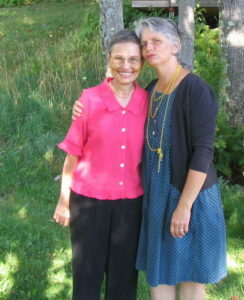 After a remission of ten years, into which she crammed more travel and culture than I could in a lifetime, wrote an acclaimed book, and joyfully remarried, the beast of metastatic breast cancer returned to claim Toni-Lee, my tiny big sister. 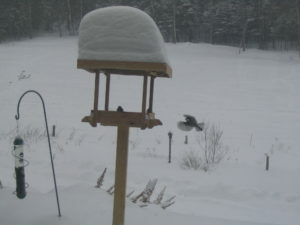 The chickadees keep getting blown sideways by today’s ferocious winds. Still, they keep up their dipping flights to the feeder, and will keep at it until the banquet of black oil sunflower seeds is exhausted. Toni had similar persistence when it came to sampling what life had to offer. She didn’t want to miss a taste, a sip, even a country she hadn’t tried yet. 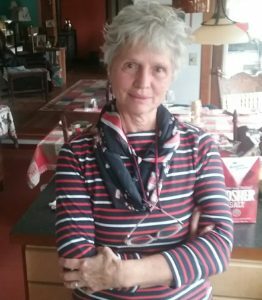 She did not go gentle, game for every treatment possible, until her doctor finally put a stop to it because she was too weak. Not knowing it was so close to the end, I went to see her in Boston just as she was entering at-home hospice care. I learned that Toni had surprised her hospice nurse by saying her goal was “to stay healthy as long as possible.” No talk of death, pain relief, or freedom from fear. Such was the will of my sister. I told Toni I’d stay until she chucked me out. During her last three weeks, she never did. “The underlying structure is quite beautiful,” I responded earnestly. And she didn’t contradict. Every morning I dressed carefully before walking over to Toni’s from my brother’s house, close by. I wasn’t sure whether she’d resent my ability to fill my clothes to bursting when her own ravaged body had shrunk so alarmingly. Still, I helped myself feel good by putting on clothes that were fun. Stasia Savasuk and her famous Style School of Brattleboro, Vermont, my home state, helped me be brave. Stasia encourages us to don clothes that reflect how we want to feel. I mixed flowered scarves with striped shirts, going for a little zaniness to lift my spirits. Still, I was nervous. Toni was fiercely competitive. She sometimes saw me as a threat, when I just wanted her to love me. Even when she was dying, I dreaded her sharp tongue and her jealousy. But as the days went by I began to relax. The nurses told me that Toni watched for my arrival every morning. She let go of all ambition, thanked every friend, every family member, every nurse, for the smallest service. We had quiet times together where I’d sit next to her bed. I would knit and she would nap, sometimes startle awake in alarm, with a “Where are you?” I’d grab her hand then and she’d drift off, anchored by touch. One morning she opened her eyes, looked at my striped shirt and knotted flowery scarf. “You look just like a little sailor!” she whispered, and smiled.